They also say you should never judge a spaghetti by its ice cream. Actually, no. Nobody says that. So listen. This thing looks exactly like a bowl of spaghetti. There are noodles that look twirlable. There is a rich red marinara sauce. Some gritty crumbles of parmesan. Except actually, there are none of those things. 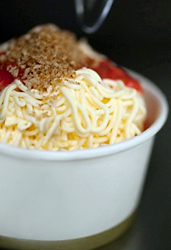 What you’ve got here is “noodles” made of pressed vanilla ice cream. “Marinara” made of strawberry puree. And “parmesan” made with a white-chocolate crumble. And some whipped cream thrown in just because. Apparently, the whole thing’s an old German specialty. Who knew. 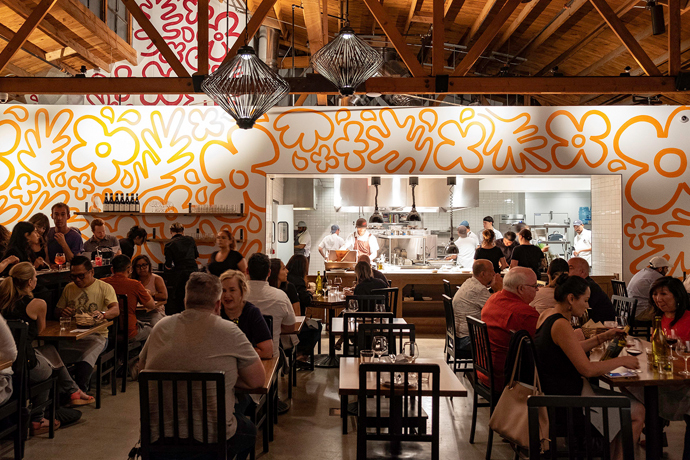 So if you’re on a date in the area—maybe a movie at the Grove or a coffee at Commissary—you’ll suggest relocating for a little dessert to keep things going. Assuming the penne sorbet place is closed.